Indie Retro News: Defender of the Crown - ZX Spectrum edition by Cinemaware Retro limited to 250 units! 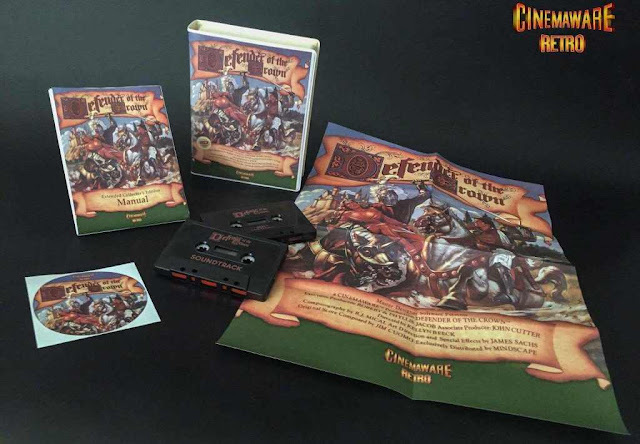 Defender of the Crown - ZX Spectrum edition by Cinemaware Retro limited to 250 units! We've been keeping an eye on the speccy forums this week and after a heads up by our good friends Cinemaware Retro, they have announced the full details of the Defender of the Crown ZX Spectrum version. As many of you know, not long ago we spoke of a rare game by Mirrosoft that according to Cinemaware was never officially released, although some of our members have said otherwise. Yet this week as shown by the image above, Cinemaware Retro have told us the FIXED version is available for order, limited to just 250 units and shipping will begin October 2016. But wait there's more! As in this rather lovely package according to Cinemaware, contains a ZX Spectrum tape which is a fixed version over from the original ROM, such as a missing screen and fixed for 48k and 128k ZX Spectrums. Other additions include a rather nice soundtrack tape, a full manual, a cool poster, sticker and lovely box art showing the game cover as it would've looked all those years ago. Such a grand game with jousting, rescuing damsels in distress, conquest and even catapults that in my opinion will always be in my hall of gaming excellence. Let's just hope the ZX Spectrum version was worth all that wait.